The local council has already started taking the necessary measures to normalize life and to provide all services to the people in Afrin. 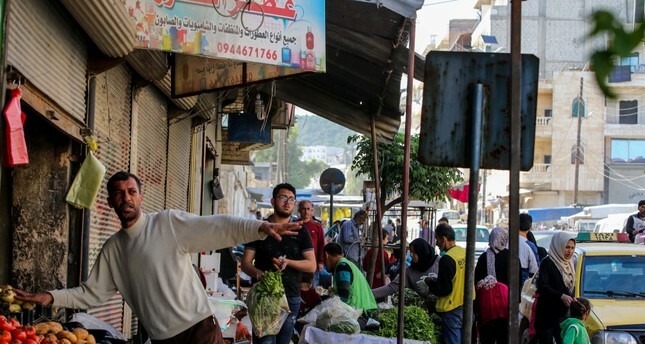 A local council established for the Syrian town of Afrin has started work to normalize the daily life after the defeat of the PKK-affiliated People's Protection Units (YPG) in Turkey's Operation Olive Branch. Twenty members were selected for the local council in a recent election in which opinion leaders in Afrin participated. Eleven Kurds, eight Arabs and one Turkmen are on the council. The local council has already started taking the necessary measures to provide all kinds of services to the people in Afrin. Different departments for education, justice and municipality services have also been established in the local council building. The local administration has made sure that water shortages are fixed and garbage collection services have returned to normal. The deputy head of the Afrin Local Council, Abdu Nebhan, said they started working two days after the liberation of Afrin. He said that the YPG had not served the people for years and that the terrorist group turned the city into rubble before leaving. "People will be astonished in a short time after seeing how beautiful Afrin has become," Nebhan said. In Afrin, a hospital that was liberated from the YPG on March 18 is also open again. The hospital had previously treated YPG terrorists, but after the liberation, explosives and mines were cleared and doctors and health care personnel were employed there. In addition, a water treatment facility was also recently repaired by Turkey. Turkey repaired a wastewater treatment plant in the area that had been destroyed by the YPG ahead of their escape from the city. The plant provides water to two neighborhoods in the Afrin city center. Turkey's General Directorate of State Hydraulic Works (DSI) of southeastern Hatay and southern Adana provinces carried out the reconstruction. The reconstruction restored running water for two Afrin neighborhoods. Ankara will reportedly pursue a policy that will prioritize the notion that Afrin belongs to the people of Afrin to help tens of thousands of Afrin locals who previously fled YPG oppression return home. The Turkish state is expected to implement a system in Afrin similar to those in Jarablus and al-Bab, which were liberated from Daesh in Operation Euphrates Shield. Operations Euphrates Shield started in August 2016 and officially ended last year after Turkey-backed Free Syrian Army (FSA) factions drove out Daesh from towns near the Turkish border. Apart from military support, Turkey extended its hand in humanitarian aid to locals returning to their homes after being driven out by the terrorist group. Schools have been prioritized in the rebuilding process in towns liberated from Daesh and Turkey's state-run Maarif Foundation has already opened several in Jarablus and al-Bab. The schools have been renovated after one of which in Jarablus was converted into a prison by Daesh when the terrorist group took over the town. Hospitals also have reopened along with post offices in Jarablus and al-Bab. Apart from schools, hospitals and post offices, housing has also been rebuilt under Turkish guidance.